Chronicles from Iran » English » Politics » JCPOA: RIP? On May the 8th, the world witnessed President Donald Trump’s decision to withdraw from the Iran nuclear deal (JCPOA). He unilaterally broke the solemn oath of his country. Whether Trump did it out of spite for Barack Obama’s presidential decisions, or to show off his own abilities, is an academic debate. Is what he did part of the American values and interests? Or is D. Trump mad as a March hare, when he kicks off he kicks off, and nothing or no one in the United States of America is capable of stopping him? Now, the moves of Europe, China and Russia, also signatories to JCPOA, are at the centre of all attention. As we write, they seem to stand by the JCPOA, warning D. Trump of a decision that may fuel instability, chaos and war in the Middle East. The whole region has been at war and on fire for decades. Instability, chaos and war are the realities that have resulted in millions of refugees and in hundreds of thousands being killed and maimed. And no one has been able to provide the beginning of a conceptual framework of alternative forms for stability and peace. None of the signatories to the JCPOA is a dove of peace. Far from recognising their own past failings in the region, each and every of them has sold weapons to the Middle East, to all sides of any conflict. For them, peace in the Middle East means heavy-handed dictatorships with whom they can do business. As long as all can benefit from contracts with secure countries, all is fine. If during the process, the Middle Easterners are oppressed and persecuted, die in their thousands from gas, cholera or bombardment, or are drowned in the Mediterranean… well bad luck. Up to now, have any of them really cared for the people? Have any of them stopped selling weapons to the warlords, presidents, princes or emirs mushrooming in the area? For Europe, the US withdrawal from the JCPOA is a part of American moves to pull out of treaties and agreements, remains of the Second World and Cold wars in politics and business, still left unburied in Europe’s back gardens. The predictable Trump administration acts can be seen as a medium for international change, pending how the international powers would write new rules for their relationships. Bigoted and self-centred, the actions of the US president have brought the European countries to ponder on their own international role and responsibilities now that the USA is not the big brother on whom they have relied since 1945. Presently, the European countries face the USA’s might over their collective sovereignties, in particular its capacity to threaten EU companies with sanctions if they did business with Iran. The very same capacity that has encouraged them to strengthen their own economies. No matter how strong the ayatollahs see themselves, in four decades, Iran under their guidance has been unable to build strong relationships based on exchange and alliance. Furthermore, it has isolated itself from the global economy. As if, by exporting its Islamic revolution, refusing to talk to and constantly threatening its enemies, the regime would gain in stature and prestige. For the last two decades, the theocracy has been eating up the capital of the country: poverty, unemployment and inflation are rampant. In pursuing the dogmatism of 1979, they have exploited the citizens and made them the instrument of their politics on the international scene. JCPOA had opened up a narrow path to the outside world and strengthened the regime; in committing to the deal, the regime has tied its fate to it. The strength of a country never resumes under one major agreement. If it did, one day the agreement would become a trap for the country, as now JCPOA is. One can write the history as one pleases. It all depends when one starts writing it up, and omitting events or justifying them as the story unfolds. As we write we are fully aware that our perspective might be regarded as that taken by the US hawks, Israel’s orthodoxes or the Saudi Arabian princes, who dream of squashing Iran as a nation. But, if each of these groups are now sworn enemies of the Iranian theocracy and grouped in one axis, it does not make them friends of the Iranian people. If any of them or their combination succeed in helping to throw out the Islamic Republic of Iran, we, as Iranian citizens, will be held hostage to another dictatorship. The change that we need must come from the entrails of the country, from its own population’s vision. The Iranian citizens must look to preserve their own collective interests without either supporting the colonialist agenda of the ayatollahs or throwing themselves in the wolf’s mouth by befriending the wrong allies. Achieving an ambitious Shiite Empire has been the sweet dream of any ayatollah. If in this process they have to sleep with the devil, bring hardship to Iranians – or other populations (see Syria) – or gamble on Iran’s integrity by appointing a military government, they will. For them, the monies for strengthening IRGC’s powers, providing them with sophisticated weapons, and training proxy militias, are well spent. They want to be a big international player, even if they have to build their reputation over ruined and blood bathed countries, including Iran. The memory of the public is short and as one piece of news chases another, perhaps it is time to remember that sanctions brought Iran to the negotiating table in 2013-15. For the ayatollahs, it was the opportunity to have access to the cash that would oil their machinery and buy them some legitimacy. President Barack Obama obliged. All signatories had something in mind beyond stopping the Iranians developing a nuclear bomb. Barack Obama needed an eye-catching deal to amend the blunders and the loss of credibility of the United States in the Middle East. For the Europeans, it was an opportunity to export into the Iranian market their goods and services at little cost. Russia and China were mostly knowledgeable observers waiting for opportunities to become more involved on the Middle Eastern scene. JCPOA was a better than nothing deal and applauded as historic by all signatories. Far from the nuclear preoccupation and the international worries, the Iranian citizens saw it as an opening to reanimate their dying economy and bring money to their pockets. The revival of a relaxed relationship with the world, especially with the West, something that has been muffled under the shroud of Islamist ideas and oppression, was secondary. In the summer of 2015, European delegations comprising high-level politicians and tradesmen headed for Tehran. The Iranian president, Hassan Rouhani, paid visits to Italy and France. Dozens of memoranda of understanding (MoU) were signed. They were pieces of papers of no financial value. Since Iran had no money to back them, financial plans were to be mounted to bypass the remaining international sanctions, pending goodwill from the USA. To build trust, the nature of the theocratic dictatorship has been minimised in Europe. The EU and the Iranian middlemen have hammered into people’s minds that if the multinationals could invest in the Iranian market (more likely to sell their stuff produced elsewhere), the regime would open up and let the young generation live a life of freedom. We have heard this phoney argument many times before from Western politicians and businessmen looking to open markets for their multinationals in dictatorial regimes. The contracts allow their companies to grow and to bank, away from the taxpayers, the fiscally optimised benefices. Now, if the consumers in those dictatorships lavishly spent their money, but the politically active citizens were hung in their hundreds, the most democratic politicians from the West would not budge, and damn the consequences for the violations of human rights. JCPOA: Any change in Iran? Before anything substantial can be gained from the JCPOA, four dual-nationals, Irano-Americans, held under false charges of espionage in Iran were exchanged under circumstances best described in thrillers. They were the bargain chips of the deal. Since the JCPOA was signed, some more dual-nationals have been arrested and they are waiting in jail to be exchanged. Since the summer of 2015, the Western media outlets have written thousands of articles on the moderate Iranian president, Hassan Rouhani, and his willingness to bring back Iran on the international scene. They have found dozens of excuses, using the paradigm of moderates vs hard-liners – good guys/bad guys scenario – to explain the shortcomings and incapacities of the government on domestic matters. In less than three years, a long list of ifs has followed. 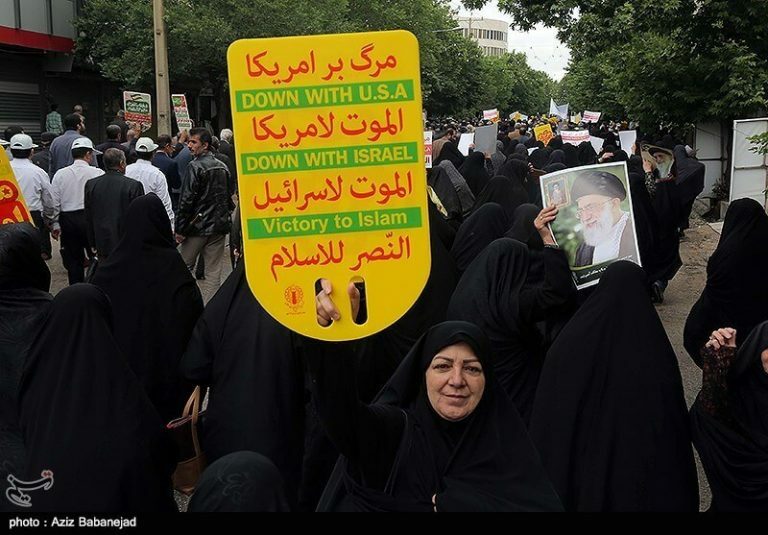 On every public gathering approved by the ayatollahs, people have chanted Death to USA. To fulfil the aims of the MoUs, the regime would have to revise its banking system and somehow air the stuffy social dominance of the religious dogmas. Nothing has budged except for one thing: BARJAM (aka JCPOA) has become a common word, used in every sentence and paragraph expressed publicly in Iran in whichever context one might think of. Hassan Rouhani’s succeeding governments have played within the limits set by the Leader.The cash that the JCPOA allowed to flow into the country vanished in the accounts of the IRGC, paid the overdue bills of various suppliers of the nuclear folly, the missile developers and the proxy militias. Moreover, more cash was available to the propaganda machinery of the Islamist regime: organisation of Shiite pilgrimage and resourcing the myriad of Islamic headquarters, Setad-e Eslami-e …. They say there’s no fool like an old fool, and a fool and his money are soon parted. Except for the large monies at stake for the EU and notably the French multinationals (Renault, SPA and Total), something that France would be hard-pressed to salvage from the JCPOA wreck, little has been injected into the moribund Iranian economy by the West. The concealed financial and banking system has stayed in the hands of the corrupt IRGC and their power has grown. The succeeding dictatorships have created years of brain-drain to the benefit of the West. A skilled professional or an academic prefers to work in a system in which one’s beliefs are not scrutinised and in which one has the freedom of expression. The fate of Kaveh Madani and Abbas Edalat, just to name the most recent cases, is telling about how the Islamist kakistocracy works. The frozen Iranian assets, warmed up by the JCPOA, if they were used judiciously, could have done some good for Iran’s broken economy by encouraging the local investors. But, the economic, financial, and environmental conditions have worsened and the violations of human rights have not lessened. Moreover, the regime freely insults foreign countries and then expects them to be magnanimous, or play by the rules known only to the ayatollahs. Mohammad-Javad Zarif, the Iranian foreign minister appreciated by his counterparts in European diplomatic circles, has lied through his teeth on several occasions; instead of negotiating, the Iranian ministers choose to take shortcuts, exploit legal loopholes and cheat whenever possible. What happens when a bunch of penny-pinching clerics catch a hive? They spoil the honey, kill the bees and blame the world for the sorry state of the hive. 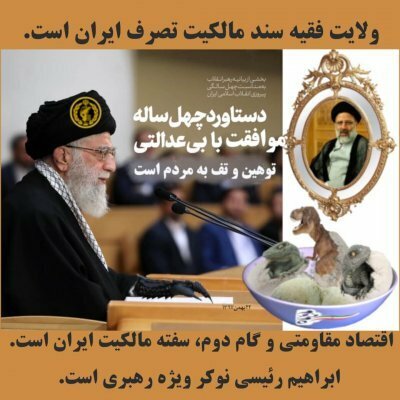 In his New Year’s speech, the Supreme Leader commanded the citizens to Buy Iranian! as he did a year before by ordering them to stand by the Economy of Resistance. But, what Iranian goods and what services to buy in a stagnating economy in which bankruptcy has soared and the pauperisation of the masses destroys the fabric of the society? The sycophants have not a clue about what he has referred to with either commands: Buy Iranian! Stand by the Economy of Resistance! However, they have praised him ever since for his informed and enlightening advice, waxing lyrical on all occasions. The Iranian economy is in tatters: the private sector is non-existent and IRGC holds the monopoly on revenue-generating sectors. Smuggling consumer goods into the country and producing counterfeits are national sports. Unable to make substantial investment in the country, the kakistocracy has encouraged an unproductive, hand to mouth economy sustained by subsidised goods. The genesis of the Iranian industrial sector relies on a collection of assembly workshops. For example, the emblematic Iranian car industry (Iran Khodro) without Peugeot-PSA, Renault and Kia Motors would not produce a single car, not even a tandem to ride. The theocracy has believed in autarchy in food provision. However, the importations surpass the home-grown products. Cultivars that have adapted to the climate have been abandoned for higher yields and water-thirsty seeds. Large amounts of imported pesticides and chemical fertilizers have been used in cultivation. Mismanagement of natural water resources has dried the rivers. Global warming and drought combined with water pollution and carelessness in waste control have played their part in killing not only the agricultural sector, but also the natural beauty of the country. As the rural areas are abandoned by their population, the poor urban population grows. Since early April, well before Trump’s withdrawal from the JCPOA, the Iranian rial has lost value to the USD and the major currencies. The government fixed the exchange rate and threatened the exchange bureaux owners with closure, even physical harm, if they did not comply. Despite this, after a little pause, the rial has continued to fall against all major currencies, nearing a 45% decline. Since January, people have been asking for their rights. The regime has ignored them and has sent the police, the bassijis and the IRGC corps to stifle their demands and arrest the activists. The farmers in need of water have been told to ask Allah for it. The teachers who have not received their salaries have been praised for their endurance… Khamenei is kissing the hands of the workers if they can work longer hours without pay. Quips from us? No! Read and listen to the Iranian media. For the past 3-4 years, the Iranian politicians, all of them, have fought like cat and dog. This has left the citizens bereft of hope in even economic improvement. In essence, the theocracy cannot change its rapacious nature. The Iranian ruling class has most to lose and feared D. Trump’s withdrawal from the JCPOA. Trump’s administration and the Iranian clerics are birds of a feather in being overbearing bigots, and fervidly intolerant. To have a better view, one should brush aside the usual bragging that serves the clerics as the tree hiding the forest. As Trump underlined that he would keep his promise of tearing up the JCPOA, the regime brawled that Trump would never withdraw since it would harm the Americans most. Then, they sang their own praises about having the strength of tearing it up themselves as an equal to US might. We will show them… we are prepared for every situation. The day after Trump’s theatrical live broadcast to the world from the White House, Ali Khamenei replied (abridged): you can’t do a damn thing! you have a light intellect and an ugly behaviour! The Iranian nation stands upright and strong. The previous [American] presidents died and their bones rotted, but the Islamic Republic remains. This little man (Mardak, i.e. Trump) will also be buried and his body will feed the snakes and insects, but the Islamic Republic will live on. From D.Trump’s trash to A.Khamenei’s dross … Many Iranians laughed at some Western media headlines: Iranian MPs burnt the US flag and chanted Death to America. A few hours later, some reported that people had been pouring into the streets in support of the JCPOA and chanting Death to USA. The regime has been pouring people into the streets whenever it needs them. Do you remember the answer of the regime to #IranProtests in January and February? Any more yesterday news from Iran? Chants and flag burning have been going on relentlessly for the last four decades on every occasion. Fake news is poison. But making headlines out of no news is no better. As the diplomatic phone lines jam between the signatories left on the JCPOA deal, and each public declaration from all sides is scrutinised, the Iranian regime calls on their friendship. It remains to be seen to what extent they are willing to or can stand by it, within the limits of their own interest. For Donald Trump’s detractors, and there are many of them, solely blaming him for the consequences of JCPOA withdrawal seems the only possible analysis. The Europeans have rushed to salvage the JCPOA. However, they are not champions of solving problems in the Middle East. When, at last, they manage to do something, the solution is entwined with another crisis, and gives birth to another monster. As an Iranian, I refuse to accept the Trumpian love or hear his calls for a futuristic democracy in Iran, even if I never believed in the JCPOA’s supposed goodies. G.W. Bush had similar words for the Iraqis and we have seen the results. As Iranian citizens, we must learn to look to preserve our own national interests without supporting the colonialist agenda of the ayatollahs. Our destiny should not be bound to a single international agreement befitting nepotists. The ayatollahs have shrouded the country and we have helped them by closing our minds, and building a fence around ourselves. #IranProtests may take longer than any social move that the Iranians have ever undertaken in recent history… We have to learn every trick in the book of Social Resistance to be able to get rid of our own monsters of dictatorship, despotism and kakistocracy. As we are novices, it is going to be a long way till something is achieved and need not to be redone. We cannot afford to compromise, but we can work for consensus, if we still believe in the genius and flair we so much like to set forth. Thomas Erdbrink, The New York Times, wrote from Tehran : How miserable have we become that this Trump should play a role in our lives, Amir said How miserable are we that our leaders constantly want to pick fights with everybody. He insisted that I write down the following: I want to live a normal life. Amir from Iran wants a normal life. Wooden, boring, uninspiring, unconvincing: for decades, the same slogan on the same board is customary provided by the regime. When asked by the clerics, their mob would put on a street-show. On these propagandist occasions, the photographs of the women are published in large numbers.